I found this lovely middle-grade and I really wished a book like this novel had been there when I was younger, but it is great. Esme sees the bones as a message from her grandfather; a connection beyond the grave. But when word gets out that Peach Hollow Farm is hiding something valuable, reporters, researchers, and neighbors arrive in droves. Esme must find a way to understand who has her best interests at heart—especially as the memories of her grandfather begin to slip away. 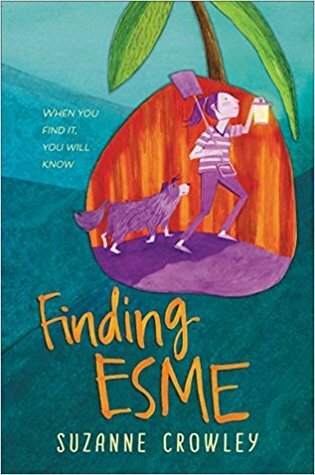 I give Finding Esme by Suzanne Crowley five out of five hearts because it was a lovely story about dealing with sorrow and growing up. It is a heart-warming novel about family and things that can go wrong with a family. Esme is a spirited young girl who has to deal with her grandfather’s death. She feels out of control and she worries a lot about her family since her grandmother has trouble making enough money to keep the farm and her parents aren’t a stable point in her life either. Bee, Esme’s grandmother, has a habit of finding things and uses it to get the things she needs, but nobody really gives them money for the service. The characters in this novel are written in such a way that they feel real and it really makes the reader live with Esme in her head. The overall story doesn’t move away from the hard subjects like death and debt, but all at the level a 12-year-old will understand. It doesn’t dumb it down and keeps it real. It’s a great book. This entry was posted in Book Review and tagged Adventure, Book Review, Drama, Romance, Suzanne Crowley. Bookmark the permalink.